Brief summary: Givaudan is a leading industrial supplier in flavours and fragrances, active worldwide, and whose products are used in the everyday life of over 3 billion people. The company operates with more than 100 locations worldwide and 45 productions sites. Strengthened by their heritage and passion for innovation, the company invests a lot in research & development to constantly innovate and offer sustainable products. Concept: The goal of the project was to have a short introduction about main trends of the fragrances industry as a whole, and of the company performance in particular. 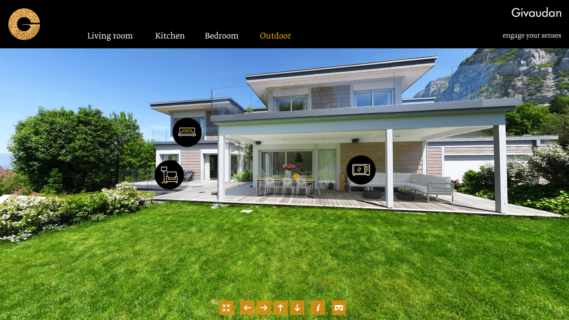 The overall look and fell had to be consistent with a daily household, where visitors can realize some of the numerous touchpoints for the company, augmented with facts and figures to be used in-house and for external communication. Solution: GlobalVision has scouted multiple locations, and submitted the report for approval. Once a suitable scenery had been found, we arranged for some “home-staging”, to ensure the virtual tour conveys the visual message seek for by the company. 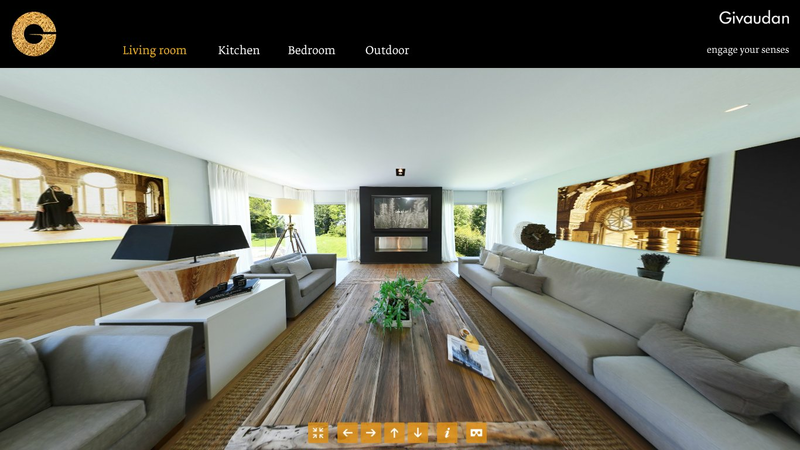 Hence, the virtual tour contained in the “House of Givaudan” is taken at a location situated nearby Geneva, Switzerland, in a peaceful environment. 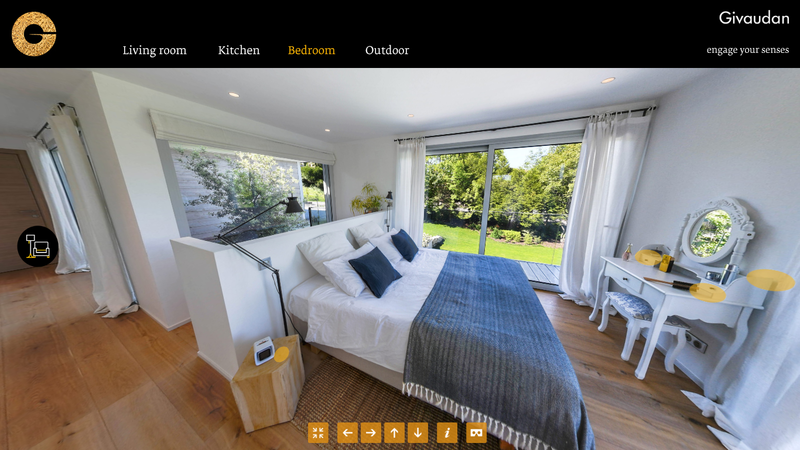 Each of the various 360° pictures taken indoor and outdoor was shot to show one of the four different spaces : the living room, the kitchen, the bedroom and the outdoor. Inside each room, interactive buttons related to an object have been integrated to give details about facts & figures, or about the company itself or even about the fragrance industry as a whole. 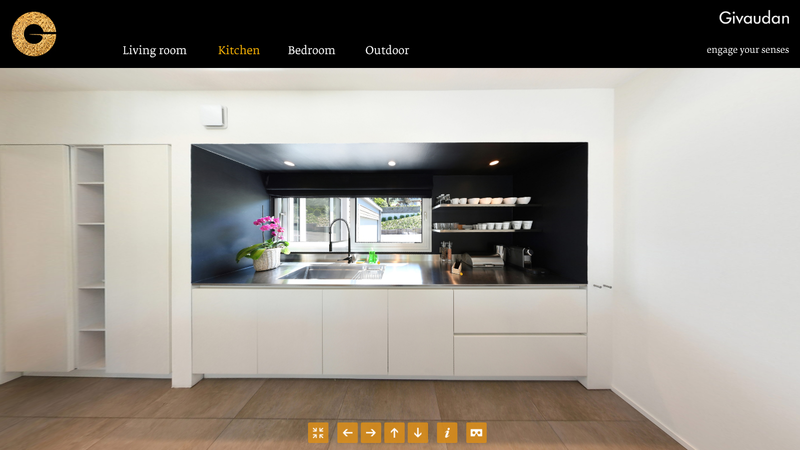 A possibility to navigate trough the different rooms in the house was also added, allowing non-linear navigation. The virtual visit is also available on WebVR with a mobile device and/or a VR headset. This immersive platform allows every viewer to enjoy the tour, no matter the medium used, and ensure everyone could receive one of the messages contained in the 360° experience.